The best tankless water heater is an energy efficient alternative to having a storage tank. Instead of storing hot water, a tankless water heater heats water as you need it. Also known as demand-type water heater, a tankless water heater is appropriate for small households. It’s also ideal for people who typically don’t draw water for more than one purpose at a time. Although it can provide a limited flow of hot water per minute (typically 3.5 gallons per minute), a tankless water heater is more practical if you only use around 40 gallons of water every day. It can make you save up to 30 percent on your electric bills. You can determine the flow rate by identifying the devices you want to run and then adding up their flow rates or gallons per minute. For instance you want the water heater to connect to the faucet and shower head. The flow rate of the hot water faucet is 0.75 gallons a minute. The shower head, on the other hand, has a flow rate of 2.5 gallons a minute. When you add up those numbers, you will get a flow rate of 3.25 gallons. Hence, you have to buy a tankless water with a capacity of at least 3.25 gallons per minute. One of the reasons why homeowners switch to a tankless water heater is because of the savings that they can get from owning one at home. After all, water heating makes up to 20 percent of a typical household’s energy costs. Tankless water heaters have energy efficiency ratings that range from 80 to 90 percent. The rule of thumb is very simple-- the higher the number, the more energy efficient the water tank is. Features like anti-scaling, glass lining, and digital displays can affect your buying decision as well. Tankless water heaters that are anti-scaling are those that can reduce buildup of mineral scale at the bottom of the tank. This is done by swirling the water. Anti-scale devices can last longer than a typical water heater. Glass-lined water heaters, on the other hand, can reduce corrosion. Tanks with digital displays are easier to operate or customize. The display would let you know info like temperature and pressure readings, among others. Installation and maintenance can optimize the energy efficiency of a tankless water heater. There are many factors that can affect installation, such as fuel type, climate, and safety issues. To have peace of mind, it would be better to ask help from a plumbing and heating contractor particularly in installing the water heater. ECO 27 Electric Water Heater is another Ecosmart unit that I highly recommend. Judging from the reviews .com, I can say that this is well-rated, too. This unit has a maximum water flow capacity of 3 gallons a minute. It should be enough to handle two showers running at the same time. ECO 27 Electric Water Heater has a digital temperature control that lets you see the temperature settings. You can also adjust the temperature in increments of 1 degree. This water heater can provide hot water with temperature between 80°F - 140°F. I can say that this is a well-made tankless water heater. Many reviewers .com are also pretty content with it. I can recommend this to small households who don’t need hot water all at the same time. It can provide hot water for showers, laundry, and washing dishes. However do note that with its 3 gallons per minute flow capacity, this unit would only be able to keep up with at least two showers at once. Just don’t expect it to provide you hot water for your laundry while there’s someone in the shower, and another person is in the kitchen washing the dishes. Ecosmart ECO 18 Electric Water Heater has a maximum flow capacity of 2.5 gallons per minute.According to the manufacturer, that would be enough for a shower head with 1.5 gallons per minute flow capacity and a sink with a low inlet temperature. This unit has a digital temperature control that would let you set temperature levels in increments of 1 degree. The company says it can help households save up to 60 percent on their water heating costs. This unit has a very simple design. Its shell doesn’t take up a lot of space in the household, so this is a great addition even to small houses, condos, and apartments. I recommend this unit because of many things. One, it is very durable. According to the reviews .com, it can last for many years without experiencing any problems. Most of the reviewers .com say they’ve had their units installed about 4-5 years ago, and their tanks remain in good working condition. If there’s only one drawback to this unit, then it may have to be the time it takes for hot water to come out of the faucet or shower head. You’ll have to let the water run for a minute or two before it gets hot. Rheem RTE 13 Electric Water Heater has a maximum flow rate of 4.0 gallons per minute. It is ideal for single shower applications.It has an on-unit temperature control with a rugged brass/copper heat exchanger. The manufacturer backs up this unit with a heat exchange warranty available. However, warranties are only valid if the unit was installed by a licensed technician. I highly recommend this tankless water heater to people who don’t use that much hot water in a day. I’m talking here of a bachelor, a couple or even a family of 3 people. If you don’t take the shower, wash clothes, or clean the dishes all at the same time, then this is a very energy efficient water tank to have at home. Most reviews .com indicate that DIY people can have this installed. However, keep in mind that you risk voiding the warranty if you do so thus it may be more practical to have a licensed electrician install it. This unit can heat water up to 150 degrees. You have the option to lower the temperature, however, so that no one in your household will get hurt. Most people .com say they have saved a lot on their energy bills after they had this installed at home. You can expect to get back the entire costs of purchasing and installing the tankless water heater in about 1-2 years. With a 1.4 gallon per minute flow rate, this Eccotemp L5 Portable Tankless Water Heater is basically good for just one application.But that’s alright because the manufacturer of this product didn’t design this water heater for use in big homes. In fact, it is a portable tankless water heater that you can bring for camping trips. This is a portable and compact tankless water heater that weighs just 13 pounds. Because of its design, it is easy to take it to cabins, barns, and any off-the-grid location. You can use it for taking a hot shower at a campsite, or rinsing off after swimming in the beach. You can even use it for washing your pet. When electricity is not readily available, this unit makes use of two D-cell batteries to power it. This tankless water heater requires at least 20 PSI of water temperature. I highly recommend this to people who like to go outdoors. Taking a shower in cold weather sounds like committing suicide, but it is not at all when you have this unit. I also think that this unit would suit people who live in areas prone to bad weather or loss of electricity. This small, powerful unit also is easier to set up compared to the other water heaters in this list. Simply connect it to a garden hose, and you’ll get hot water. You can also change the temperature settings by adjusting the knobs located up front. Rheem RTE 9 Electric Tankless Water Heater is more appropriate for homes. It has a 3 gallons per minute flow rate. It measures 10 inches long and about 7 inches wide. It is very compact that it should fit well in any house, particularly apartments and condos. I can say that this is another well-rated tankless water heater from Rheem. The consensus is that it is well-built and thus should last for a long time. Many satisfied reviewers .com say that the response time for hot water is faster with this unit. They say that with this water heater, you can feel the water warming up in around 5 to 10 seconds. Within 20 seconds, you will have hot water. With that fast of a response time, this water heater can save you lots of time especially in the morning when you are running late for work. What I like about this tankless water heater is that it can last for many years. Basing on the reviews of satisfied owners .com, the water heater can last for 5 years or more without being touched or repaired. It’s a proof of how well-built and durable this unit is. Atmor AT-900-03 Tankless Electric Water Heater has a 0.5 gallons per minute flow rate. It is thus ideal for single sink application.It can help you lower your electricity bills by up to 30 percent. It is also compact enough to be brought in your RV. It has an elegant design, too, that allows it to blend well into the home environment. This may not have be the right choice for a big household, but it has its redeeming qualities. One is that this instant water heater can be installed even by non-electricians. DIYers should be able to install it by themselves. I also like that it is very compact and lightweight. Weighing less than 5 pounds, you can bring this the next time you go on a camping trip. It also says that this unit will be leakage-free at least in the first seven years of use. Of course, just don’t expect this water heater to give you hot water for your showers and laundry simultaneously. Its 0.5 gallon per minute flow rate just won’t be able to keep up. But if you just want to wash your hand in warmer water during cold mornings, then this tankless water heater is right for you. Rinnai RUC98iN Ultra Series is a tankless water heater that uses propane or natural gas. The unit itself is about 26 inches tall and 10 inches thick. But it is very heavy at 61 pounds. The water heater has a gunmetal gray body with the controls found on the lower lip of its front panel. Aside from a digital display, there’s a power button and buttons for water temperature and gas control. The temperature button can also be ‘locked’ to prevent unauthorized access. I recommend this water heater to small households with around 3-4 people. It has a maximum flow rate of 9.8 gallons per minute, so this should be enough to provide hot water to multiple faucets and shower heads. It is ideal, too, for homes in cold weather regions. It can provide hot water with temperatures ranging from 95 to 140 degrees Fahrenheit. This is a well-recommended tankless water heater that is, however, a bit pricey. You’ll really have to open your wallet, so to speak, if you want to get this unit. It also makes use of 0.75 inch water and gas connections instead of the regular 0.5 inch connections typical in most homes. Moreover, an authorized Rinnai repair personnel has to be on top of its installation and maintenance if you don’t want to void. With an excellent maximum flow rate of 6.6 gallons per minute, Takagi T-KJr2-IN-NG Indoor should be good enough for a household of 3-5 people.It can run several showers simultaneously, which means you or your spouse can shower in separate bathrooms without having to worry about a dip in the flow of hot water. Takagi T-KJr2-IN-NG Indoor is a gas-fed water heater that requires professional installation. Because it is gas fed, it requires venting outdoors. Although you’ll have to pay more because this heater requires professional installation, you can at least be assured of consistent water temperature. One of the things I like about this unit is that it has exhaust and water temperature safety controls. Simply put, the unit turns itself off in case of overheating. It can also protect itself against frost very well. But like most of the products in this list, the unit has to be installed by a pro for the warranty to be valid. Many people may think twice about getting this unit because of its price. I say that if budget is not an issue at all to you, then you should not think twice about buying this product. It is that good. Bosch is a reputable brand so you may be very well inclined to choose this over the other tankless water heaters in this list. BOSCH T under sink water heater won’t disappoint you at all.It could be the practical solution to your hot water woes and help you save a lot on your energy bills in the long run. This unit is lined with glass to prevent leaks. It is built to be tough and dependable. This water heater fits snugly in most home sinks, so you or your spouse will be able to get hot water right away. This is an ideal addition to kitchens, powder rooms, patio sinks, pool houses, and small apartments. It can also be used in office settings, RVs and boats, and garages. You can also have this installed in the wall mounted on the floor, or simply put under the sink. Once installed, you simply have to switch on the faucet to get hot water right away. This is a good solution for small households. If you think the 2.5 gallon unit is a bit small, you can also opt for other sizes like the 4 gallons and 7 gallons. I like that the unit looks well-built and sturdy, right from the moment you get it out of the box. However, like most of the units in this list, installing it can be a bit difficult. 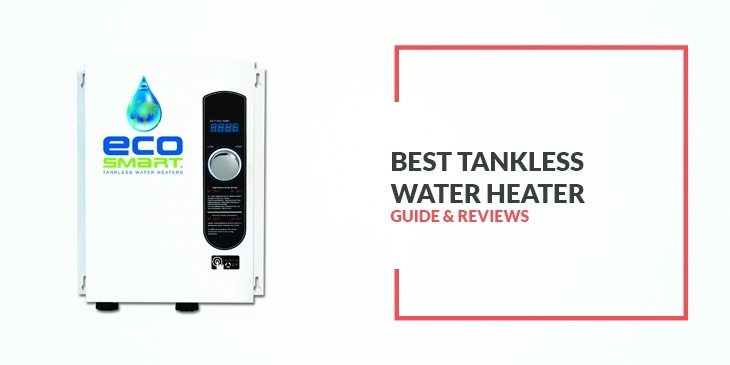 It isn’t the most budget-friendly water heater in this list as well. Eccotemp FVI-12-LP High Capacity Water Heater that is powered by liquid propane has a maximum flow rate of 3.6 gallons per minute.Thus it is ideal for households with no more than four people. It can run two flow-restricted showers at the same time. I like its digital LED display that shows the current water temperature. There are two regulator knobs on the lower part of the front panel. One is for controlling gas flow while the other is for regulating the water flow. In order to get your desired water temperature, you will have to ‘play’ with the said two knobs. Eccotemp FVI-12-LP Water Heater needs more than 30 PSI of water pressure to work, so be sure that your place has enough water pressure. It can provide hot water with temperature ranging from 90 to 140 degrees Fahrenheit. This unit cannot automatically maintain the water temperature, though. The unit itself isn’t the most attractive. There are only two color choices- silver and white. But let’s face it—color of the unit isn’t that big of a deal when shopping for a tankless water heater. Many reviewers .com are very contented with this tankless water heater. They say it is ideal for a household of no more than 3 people. They also say that hot water comes out of it within seconds. Getting the best tankless water heater installed in your home could be one of the wisest decisions you’ll ever make. Doing so will give you a substantial amount of savings in the long run. Studies show that tankless water heaters can help shave as much as 20 percent from a typical energy bill. Moreover, think about the convenience of having hot water anytime you need it. You can take a shower in the morning without having to worry about hot water running out. And you can wash your hands anytime of the day, even during the winter season.